The Conservatives have won control of Cambridgeshire County Council, taking 36 seats, while UKIP lost all of their 10 seats. The authority had been under no overall control for the past four years and a party needed to get 31 of the 61 seats available after boundary changes to be in control. In the last vote, the Tories won 32 seats of the 69 seats available. Labour have taken seven seats, including gaining an independent one. The Liberal Democrats have won 15 seats and there are three independent councillors. The Conservatives are celebrating after winning back control of the county council. Their gains have mostly been at the expense of UKIP - which has been wiped out in the county where just six years ago it celebrated taking control of its first council. Former UKIP council party leader Paul Bullen told us the perception was that since the referendum UKIP's job was done but - he said - "I don't believe it is". He was previously elected to a seat in St Ives, but after moving house he stood in Warboys this time round and did not gain the seat. The Liberal Democrats gained one extra seat from the Conservatives - Hunts North and Hartford. But considering they have high hopes of Cambridge in the general election, it was Labour, which controls the city council, which did well there. The party gained one seat from independent former city mayor John Hipkin. After an extraordinary election in 2013, in which the Tories lost control of the council for the first time since 1997, it appears the county has reverted to its traditional political landscape. 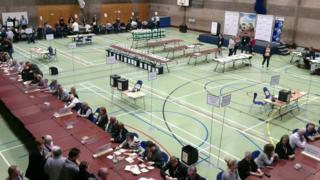 The count is under way in the first mayoral vote in Cambridgeshire and Peterborough, where turnout was 33.8%. In Peterborough, where there were no council elections, turnout was 24.7% which equates to 33,201 votes. Six regions of England have held elections for newly-created combined authority mayors, whose remits will cover multiple local authorities, in mostly urban areas. Their main responsibility will be to decide their region's economic strategy, and many will have powers covering other areas such as transport and housing. However, their exact powers will vary according to the terms of the agreements each region has made with the government.